Our reality is a holographic grid program created by thought consciousness that repeats in cycles of creation called Sacred Geometry. The cycles makes is appear as linear time in sequence and synchronicity. The grid is a matrix of sound, light and color - through which we experience time and emotion as it is an electromagnetic grid - based on polarity - of duality of experience. The Earth's energy grid can be thought of as a web that holds or links the Earth together. The energy grid is effected by many influences - electricity, magnetism, light, color, heat, sound and matter. This is an illustration representation (below) of a "grid" of energy. It is the very essence and fabric of the universe. It is the energy that connects all. In the illustration the grid has boundaries. It had to be drawn that way for the sake of explanation. When I see grid - it has no beginning, no ending. The grid is above, below and on all sides of me. I am of and in the Grid and when I have unconscious awareness I can be on the Grids as well. The grid shimmers with "current" or grid flux. It has no color as there no color at subatomic levels as such. Color is a visual portion of the electromagnetic spectrum. It demonstrates a continuity of energy showing length and frequency of that particular pattern of energy - ie: the color red vibrates more rapidly than the color purple. Purple vibrates much slower in frequency. Color is just a complex neurophysicalogical response. That's what makes the different color manifestations. Why we call them what we call them is do to human labeling. At the interpretation stage is where color frequency energies. If you place the grid vertically you will see it makes a four-sided diamond shape - following creational geometry. It is the interlace weave pattern of Universal Essence. It is what has been referred to as, "God's Trowel". When energy flows unobstructed the flux remains relativity even - though there is always intonation at all times. You can also see examples of how the shape forms other geometry for manifestation. Human DNA is configured by this geometry. In order for the flux to have different levels of intonation there must be a catalysis of some kind. Space tells matter how to move. Matter tells space how to curve. Matter is the "densification" of energy. Thought and action are two of the different types of catalysts. There must be movement of some kind to effect change. Change as we perceive it differs universally. There are many "Laws" that govern the Grids. There is a 'Law of Balances', 'Laws of Neutrality', and yes, there are immutable laws. Immutable laws are codes of energy that once put into motion cannot be stopped and they must play themselves out to whatever conclusion. How it effects us is in equal ratio to our own energy patterns. Laws of Attraction apply here and what determines them is all our thoughts and actions and the types of experiences to which we have engaged whether it is this lifetime or another. Immutable energies can not be stopped, there are loop holes and they can be, in certain incidences, be alteration as to the way the event is channeled ( to some degree) but not stopped completely. Example A. is a Flow Line. It usually represents an even energy flux. If I see this it means that expression is moving in harmony without much impedance. Illustration B shows a DDS grid line. What is a DDS? DDS is a Dynamic Dimensional Space. This line usually sparks the initiation of a telepathic or telekinetic event. C. In a synchronic or mirrored event it means that events have connection or are linked in ways other than regular sequence like flow lines are. Synchronicity is an event that singles itself out to have importance to us bridging the abyss from the unconscious to outer consciousness of reality in our everyday lives. It grabs our attention if you will. The feeling of "dejavu" is a fine example of this type of expression. Synchronicity shows itself in creative manifestations, by images, sounds, or events that are all linked by ones observation and it brings one to a higher level of awareness and reality about themselves others are some thing. The spike in the grid as illustrated in illustration D, represents a twenty-four hour event. It is usually sharp a spiked very high off the grid. E. Is a time skip, that is to say these energies skip and go out of phase or pattern. They are somewhat more unpredictable than any of the other lines and karma plays an incredible amount in these types of grid markers. When I see a duration and intonation like illustration F., it tends to be a Universal event or connection. Sometimes events that are traditional religious, or spiritual comprised manifest this way first. G. Represents a series or 'sequenced' event. This means that there will be a repartition in the pattern or a string of events that will "appear" to happen one after the other. By the way, sequence or what we term as sting events only appear in logical sequence to the conscious mined. It does that so it can make sense and order of reality. Reality, however, isn't always sequential, but that's linked temporal physics where effect can precede cause. H. Represents a series of events that take about 72 hours to manifest on the physical earth plane. They are usual linked by similar resonance and follow a spiked pattern that shows intensity. Usually the more spiked the pattern the more obtrusive the event upon the earth plane RT line. There are so many other different patterns. I have only represented a few here just for the sake of explanation of this topic. The illustration on right, is an example of how one event can and does affect all dimensions. I have been seeing this for years, now. I have soul traveled the grids since childhood. On these different levels are other manifestations of existence. It may be parallel or not. I haven't drawn ALL the different dimensions and levels available. I couldn't - it would be impossible to do so. I just gave here a sort of quick representation of what layering and dimension looks like as it carries the event. The bottom part where you see what looks like a fan that bottom part is the Pool of Souls. It is the Primal Essence of all creation. It is where ALL is created and manifested from. The squiggle line inside is the best I could do to represent what looks like the petals of an open Lotus flower. I'm not sure I still understand the full potential of that as yet. As you can see, no thought or action - no matter if it's past, present or future - escapes the grid. Everything has an effect on everything else. Is this what they mean when they say no person is an island unto themselves? It becomes quite clear why we are responsible for all our thoughts and actions. Look what one thought does! As the effect is moving across the grid it flows down (only a human directional term for sake of depiction---not an actuality) and enters the pool of continuing flux. This is why we can only create from what we create. Universe takes great precaution not to "contaminate" the Universal Essence Of Primordial Flux. This is why there are Gate Keepers as such, for lack of a better way to explain, and there are guardians (again human labeling as a way of explaining) will not allow entrance. This is also why one can never enter levels or dimension that they are not "frequency ready" to experience. Like begets like energies. It's like a built-in security device. Whatever your frequency is where you will resonate or travel to - that's why most individuals never make it past the Astral Plane. Emotional body must be clear of agenda and negative human conditioning in order to reach all the many different frequencies available. The general rule is: One can travel to the levels/dimensions/universes to which they have the Key or Symbol to - the key being frequency, vibration, resonance and experience. They may travel there and any that are below that one in frequency, but they can never go higher in frequency than they can achieve at that particular time. Could the Universal Primordial Flux become contaminated? Yes, it could. How? By us! If we were to continue to engage in strictly negative thought and action devoid of any higher spiritual essence, yes we could in fact contaminate the pool. Eventually, we would create another sub-level of subatomic particles that would become dense matter. How do you think (the word Hell is just a reference word and not meant in a religious context) what we call, Hell was created? It was created by contamination of self-indulgence and negative ego base thoughts and actions. These create dense energy. I've been reading energy a long time. I can tell you the difference between hatred as a density of energy vs. love as a lighter energy manifestation. We are the ones that create our quality of reality---from many different sources. Earth plane manifestation is a complexity of energies manifested by Space, Time and Matter. Each sub-cell of Earth's energy grid contains the experiences of everything happening - all reality - that has ever occurred within it. In other words, each cell retains a complete memory of its entire existence. As it relates to areas of population, the memory of what was experienced - in a large say - for example - determines how that city evolves a collective consciousness. The collective karma is affected. The karma of that city, in turn, affects the cell memory karma of that entire region. These memory cells have natural movement due to magnetic influences. Movement also comes out through human thoughts and actions. No cell is free of karma. Every place has history - moments built upon the moments that came before. Each place is touched by its visitors and inhabitants - not only human but also those physical and etheric lifeforms that preceded us. Certain cities have developed in a particular way, based upon the overall polarity of those cells in which they reside, and each city's position on the Earth. So for example, if we look at those major cities found on or near water - like San Francisco, New York, Los Angeles, Tokyo, or Sydney - we can see that these cities have received great nourishment. These areas have been constantly nourished due to thier dynamic positions within the cellular boundaries, and in the relation to the boundaries of water. The balance of elemental forces within each cell affects its makeup, its health, just as the internal thoughts and actions do. Water stimulates that which is intuitive, creative, thus creativity and diversity have flourished in these cities. That was based on the old grid pattern. The energy changes that are now beginning to take place will completely alter the regional dynamics. The new energy will be different. The new sub-cells are more numerous and denser in their capacity for memory. So twice as many cells - each having individual characteristics - will exist. They already exist in the etheric realm, but the new cells are not receiving very much nourishment from Earth and its elements at present. Most of the energy is still being drawn by the old cells. Right now, the old cells, and the new cells, are actually competing for energy. The old cells are dying, just like skin cells on your body will die. And as they die, they try to draw energy to sustain themselves, taking it from wherever they can. The environment - the energy of the elements - has been so weakened by our pollution that there is very little left to flow into the cells - old or new. The new cells have remained weak, continuing to draw mostly from the etheric realm. But with so little energy or food coming from the elements of nature the old sub-cells are turning to the only remaining source of vitality compatible with their structure in this reality - man. The cells are taking energy from humans. This varies greatly from individual to individual. Just as a city, town, building or region creates its own karma, so does the individual and collective consciousness of man. How one lives his life determines the kind of interaction between himself and the cell in which he (or she) lives. Intuitively, they are seeking a more balanced cell. Intuitively all people know the dynamice between themselves and the Earth. Those who listen and trust are more likely to take action and relocate . A balanced person will not draw to himself unbalanced forces. "Like seeks like". People in previously energized areas - many of the world's cities, for example - could be feeling depleted, just by virtue of the fact that they are living in a dying cell, in an environment that does not support rejuvenation. This drain on human energy has been further aggravated in these areas by the dwindling element of air, referring to pollution. Pollution and negative thoughts have reached a point it's simply no longer possible for this element - air - to rejuvenate the sub-cell region through which it flows. The same condition affects the cleansing properties of the element water - oceans and lakes. The new cells operate on a different vibrational spectrum not yet touched by our pollution The new cells are relatively clear of stored memory at this point. It would be comparable to buying a new computer disk. It is ready to hold memory, but until it is put into use, it is only potential. The new cells are not drawing energy from humans. They are much heavier "cosmic-force energy" at this stage. Once they lock in (which I see in about 3-4 years), as we reach the fulcrum in the precessional cycle, they will then seek a rooting, and there will be a period of equalization or balance. This change will happen very rapidly. Suddenly, we will find ourselves in the midst of the new energy and the old cells will simply be gone. The old memories can be retained within the new memory cells, and by those individuals and groups attuned to the new cells. But these transferred memories won't have the same intensity or memory charge as they had in the old cells - the storage capacity will increase exponentially! In other words, they could take all the old memory, although perhaps slightly altered, and put them all on a little shelf within their total capacity. This is because they have such great volume by comparison. Awareness will function at many levels and dimensions simultaneously. There will be a much greater capacity for exchange and communication with the Earth force. This is almost like a new software conversion on a computer. The invention of computers is nothing more than a manifestation of our collective vision into the future of life itself. Computers were created - not to serve man - but as an experiment for humans to realize our own true capacity. Computers are a way of trying out our ability to expand our own capacity as humans. This has to do with our changing DNA patterns. There is a transformation occurring in the very blueprint of our makeup. It will be established with the birth of the next root race - the 'Blue Rays'. All species - plant, animal, human - are highly adaptable. The basic systems of life, given some minimal parameters, is able to adjust and survive. As Earth's energy cells continue through this change, individuals will be affected in different ways. If you are in a state of balance - meaning that you are working on your life's path, moving forward with little steps that hopefully lead to larger steps - then the conversion, and the ability of your body to change, needn't be that difficult. Everyone will be aware of it to some degree. Electrical sensations in the body will be detectable, even in the most balanced person. Those that are having difficulty in life, however, will need to look at the relationship between themselves and everything else in their lives. Stress is one of the things that is going to throw the body's central electrical system even further off-course during these changes. The whole immune system goes right down, because the body needs to adapt to these new grid levels - so it can pull energy from the new pattern. A stressed person won't be able to put the proper internal energy into making the shift. So the new energy will be all around, but the stressed body won't be compatible to receive that energy. Imagine the new cells all emitting energy - the next step for us is to prepare to access the new energy by attuning to it now. This is important for good health in the future. Illnesses that are grid-induced will always be electrical in nature - headaches, fatigue, memory loss, disorientation, feelings of agitation, vision difficulties, and ringing in the ears. Many of these symptoms may be the result of living in an old cell that is dying while engaged in a lifestyle that is unhealthy or unbalanced. Most of these conditions can be traced back to a basic imbalance of electrical forces in the body due primarily to negative thoughts and stress. If you are feeling stuck - and not moving forward on the truths you seek here on earth - then you are under stress. This leads to overload and illness. More and more people are showing evidence of being out of balance. More is written about mental illness such as depression these days. Some people are acting violent or erratic for no apparent reason. The energy grid does not cause mental illness. What happens is that the new energy pattern is still grounded in the etheric realm. It is fluctuating a lot - solar flares, disruptions at the Earth's core, and planetary alignments all influence it - causing the grid to through up spikes. It's like lightening coming out of the cells. When a cell experiences one of these energy spikes the whole cell actually becomes electrically charged and the sub-cell gets agitated. Their charge level actually increases, which forces a higher charge level in all animals, all plants, and all people within the cell. So now you are taking in Earth force energy at a higher level at a higher frequency. Most people are taking in pretty low Earth energy, and solar energy, due to a significant amount of stress. In a state of balance you can tap into higher psychic abilities. What we think we shall become. Listen to your intuition (little voice). 'Geopathic stress' may be defined as developing bodily imbalance or illness, due to lines of harmful energies which radiate from the earth. Earth acupuncture is the process used to neutralize these fields. Geopathic stress has been found to be the common factor in many serious and minor illnesses and psychological conditions, especially those conditions in which the immune system is severely compromised. Cardiovascular deficiency, attention deficit disorder, immune deficiency disorders, chronic fatigue, and cancer, are samples of chronic geopathic stress influence. Some lesser effects of influence are chronic body pains, headaches, sudden signs of physical aging, irritability, and restless sleep. It is also a common factor in cases of infertility and miscarriages, learning difficulties, behavioral problems and neurological disabilities in children. When treating patients who continue to be effected by earth radiation during periods of sleep or work, response to treatment tends to be slow or uneventful, however when their home or work place is neutralized, the geopathic stress conditions resolve themselves and the body begins to heal. Hartmann Grids were discovered in 1950 by a German medical doctor, Ernst Hartmann. The lines form a grid around the earth, running north to south and east to west, and extend to a height of 60 - 600 feet. The north-south lines appear approximately every 6 feet 6 inches and the east-west lines appear approximately every 8 feet 2 inches. According to Dr. Hartmann, the worst place that a person can sleep or work is over a Hartmann knot, where two Hartmann lines cross, as harmful radiation is intensified at this juncture. Geopathic Zones have a range of influence from 2 to 200 feet, and reach a height of 600 to 30,000 feet. Their direction is random and may be horizontal, vertical or diagonal. These distorted fields of radiation are harmful to living organisms, and produce the geopathic zones. It is not uncommon to find them parallel to, or imposed upon the 'Hartmann Grids'. Personal Zones are also random in direction, with a variable range of influence and height. These zones produce energies that uniquely effect an individual on a personal level. Simply stated, they produce an energy that grates on the energy of any given person, producing a chronic subtly annoying and irritating effect. Animals are also affected by these zones. Interference Lines, as with Personal Zones, are random in direction, with a variable range of influence and height, and produce an energy which interferes with one's personal goals. Interference Lines were only discovered several months ago, and I can attest to the power of their negative influence, and the quick and incredible positive changes that occurred when they were neutralized. I strongly recommend that one's house be checked for Interference Lines if one has a home-based business which seems to be hindered in some way, or feels that "something" is blocking one's goals. I personally had 10 interference lines running through my house. The day after neutralizing them clients and money began pouring in; I was truly astounded. There was a definite shift that occurred, and continues to this day. Office buildings should also be neutralized to increase production and cash flow. Neutralization of all geopathic lines is first accomplished by discovering the lines through dowsing. After finding the direction of flow and center of the line, we bury copper wire perpendicular to its center. This blocks the line, causing the energies to dome over the structure being neutralized. The effect from Hartmann and geopathic lines can literally be seen in the atmosphere, as they tend to produce a gray, dull appearing sky, typically seen in many parts of the Midwestern U.S. When these lines are blocked and dome, the atmosphere is suddenly relieved of these energies and a beautiful blue sky appears directly over the structure. Copper rods, or anything else, must only be buried at a site with the landowners' explicit permission. There is another method of neutralizing geopathic lines using a more co-creative method with nature. We do this by assisting Nature's devas and elementals - nature spirits - to clear the atmosphere themselves. When we bury copper rods over a geopathic zone, we are basically using hardware - a third dimensional tool. This method works well and is excellent for those who need to see or do something physical before they can comfortably believe in an intended effect, especially if that effect is objective. It also works well for clearing small areas, such as under a house or a small plot of land. There are certain drawbacks to this method however, particularly when one considers the great masses of land that are in need of clearing. Also be aware that not only land, but all bodies of water, including the oceans and rivers, have geopathic zones coursing through them. These are beyond our ability to neutralize through the technique of burying rods. To better explain the manner in which we can work with nature spirits to neutralize these zones, let me briefly explain the nature of devas and elementals. Elementals are the creators of form, or the "form builders." As an example, consider the process that occurs when a seed sprouts, grows and becomes a Ponderosa Pine tree. Consider the difference in appearance between a small seed from a pine cone, and the end result of that seed - a towering adult tree. The elementals are the intelligent sparks of consciousness who worked with the energy of the seed, eventually forming it into a tree. All living things take their form through the activities of an elemental, and not all elementals are part of the plant kingdom. 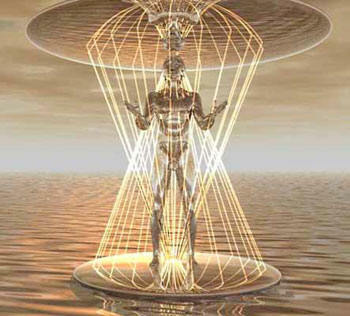 A deva is an intelligent energy that works in conjunction with the elementals, but more in a overseeing capacity. The devas do not create form, but are responsible for the activities of the form builders. Where an elemental may have responsibility over a pine seed, the overseeing deva may have responsibility for the entire Pine forest. With this understanding, we can see the great ability and knowledge that nature spirits possess of their given environment. We also know that they can literally "build into" that environment certain elements or qualities. Therefore, if humans were aware of an element that would be helpful to the environment, and discussed it with the devas who agreed and chose to "build" it into their environment, then we would be working co-creatively with Nature towards the healing of this Earth. And that is exactly what we have done when we neutralize geopathic lines with the help of the devas and elementals. Two individuals, Slim Spurling and Bob Dratch combined their efforts and produced an audio tape called "Swept Clear." This tape contains holoforms of pure water, and emanates sound frequencies which are used to free stuck patterns. When played through Slim Spurling's Harmonizer we have seen tremendous results in air pollution reduction in various cities. It was suggested that the frequencies produced by the holoform tape literally alter the structure of pollutants, and could neutralize emanations from geopathic zones. If this was true, then integrating the tape's frequency into the environment should produce a continuous reduction in air pollutants and an elimination of geopathic emanations. To test this theory I did an experiment. I went to a local lake and dowsed seventeen feet along its shore. I was looking for Hartmann and geopathic lines, lines interfering in the welfare of the inhabitants of the lake, and personal zones for the inhabitants of the lake. I found 12 lines. Next I spoke to the devas and elementals, played them the tape, and asked them their opinion. Their response was very positive. Five minutes after our discussion I again dowsed in front of the lake, but this time there was not one geopathic line! They told me that they would incorporate the frequency over the entire hundred-thirty-five acre park in which the lake resided. This was the domain of the Park Deva. To check, I drove to the other side of the park and dowsed - no lines. I drove to another location - no lines. I looked up to the sky and the clouds parted, displaying blue sky over the entire circumference of the park. They had heard what I had done at the lake and were waiting for me to invite them to take the frequency also. I played them the tape and they spread it throughout the entire city. Afterwards I drove all over Columbus dowsing, and there were no longer any geopathic emanations. This is exciting enough, but to add to the joy Columbus repeatedly stands in a circle of blue sky, while dark clouds and pollutants surround the city. Find a quiet place . . . free of distractions. Adjust the lighting and room temperature. . . Adjust clothing. . . footware. . . eyeglasses. Sit down or lie down . . .
Find a position that is comfortable for you. . .
Quiet your mind. . .Still your thoughts. . . Relax your body. . . Your face . . .your jaw . . . relaxing. Your arms. . .your hands. . .feel at peace. . . Your torso. . . your hips. . .letting go. . . Your legs . . . your feet. . .totally relaxed. Focus on your breathing. . .
Inhale slowly and deeply through your nose. . . Retain the breath as long as is comfortable. . .
Exhale through the mouth slowly and completely. . .
Repeat for two more breaths . . . or as comfortable. from your physical body. . .
Take this light and send it out into the grids. . . Follow it as it goes outward. . . upwards. . .
until you reach the light energies of the grids. Flow through the grids becoming one with their energies. . .